Learn how to fry catfish that's golden brown, crispy and never greasy. Pat the catfish fillets dry with a paper towel and set aside. In a medium shallow dish, add the cornmeal, flour, salt and pepper and stir to combine. Set aside. In a second bowl, beat the egg and milk. Add the oil to a depth of 2 to 3 inches in a large, heavy 10-inch skillet, leaving at least an inch of space from the top of the skillet. Over medium high heat, begin to bring the oil to 375 degrees. Bread your fish while you wait. 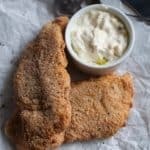 Working with one piece of fish at a time, dip the fish first into the cornmeal, pressing the mixture on well, then into the egg/milk mixture then back into the cornmeal. Set the fish aside to rest while the oil heats. Repeat with the remaining fillets. When the oil is hot, add one piece at a time and fry until golden on one side--about 4 minutes, then turn and fry the second side. Make sure not to over crowd your pan, leaving 1-2 inches between the fish. Transfer the fish to paper towels to cool slightly. Serve warm on buns with tartar sauce if desired.